The meniscus is important for transmitting loads across the knee. The menisci increase the surface area of contact and fill the gaps between differently shaped articulating surfaces: the round femoral condyles, the relatively flat tibial plateau on the medial side, and the convex tibial plateau on the lateral side. Removing the menisci increases the contact pressure between the femur and the tibial articular surfaces and may predispose to early arthritis. On the medial side, load is shared equally between the medial meniscus and the articular surface. 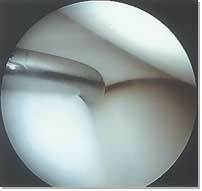 However, the lateral meniscus must bear most of the lateral side load transmission alone. It seems that degenerative changes are more likely after partial lateral meniscectomies than after partial medial meniscectomies. The meniscus has been shown to play a vital role in load transmission across the knee joint. Biomechanical studies have demonstrated that at least 50% of the compressive load of the knee joint is transmitted through the meniscus in extension, and 85% of the load is transmitted in 90 degrees of flexion. In the meniscal deficient knee the contact area is reduced approximately 50%, which results in articular cartilage damage. Partial meniscectomy has also been shown to increase contact pressures significantly. Another proposed function of the meniscus is that of schock absorption, although it seems that the menisci do not play a significant role in shock absorption. The menisci are also believed to contribute to joint stability, especially in ACL deficient knees. Finally, the menisci may serve as proprioceptive structures providing a feedback mechanism for joint position sense. Turning or twisting of the knee may cause tearing of the meniscus. When the torn part is mobile, flexion and extension of the knee can displace the fragment out its normal position. Typical signs and symptoms are clicking, catching or snapping. A knee effusion may or may not be present, but most patients will have jointline tenderness. Giving way and locking are also frequent symptoms of a meniscal injury. Displaced bucket handle tears, which usually go with chronic ACL deficiency, will cause the knee to lock in flexion. Anteromedial pain with mechanical block to extension reflects a displaced bucket-handle tear or ACL tear. Medial meniscal tears are more often symptomatic than lateral meniscal tears. Most tears occur in the posterior load-bearing area, causing medial and posteromedial jointline pain and effusion. Pain in the anterior third is not from a meniscal tear, because no weightbearing occurs there, and anterior medial meniscal tears are extremely rare. However, patients with a displaced bucket-handle medial meniscal tear may complain of anteromedial pain with a mechanical block to extension, which is often followed by an effusion. Early clinical and MRI diagnosis, and appropriate treatment of meniscal tears, especially in people younger than 40, are very important for the longevity of the knee joint. Meniscal cysts were first described by Ebner in 1904. They are often associated with a specific complex type of meniscal tear called a horizontal cleavage tear, usually of the lateral, rarely the medial meniscus. 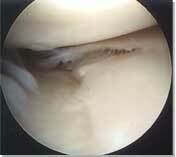 However, isolated cysts without meniscal pathology have also been reported. 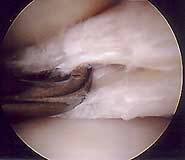 Clinically, meniscal cysts look like a small lump, usually at the level of the lateral joint line. The size of the lump often correlates to activity level and the chronicity and the complexity of the meniscal tear. They are encapsulated, hernia-like structures, and they contain viscous synovial, often gel-like, fluid which penetrates through the torn meniscus and accumulates under the skin. Several theories have been proposed regarding cyst aetiology, including traumatic and degenerative origins. Histology shows a meniscal cyst formation which originates by influx of synovial fluid through microscopic and gross tears in the substance of the meniscus. A meniscal tear with a horizontal component, as well as a tract that provides an exchange of fluid between the joint and the cyst, is often seen. 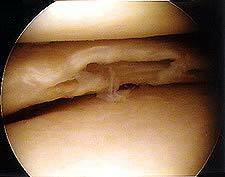 Meniscal cysts are multilocular and lined with synovial endothelial tissue. Meniscal cysts can be drained with a needle (although this can be difficult because of the viscosity of the content of the cyst) but they will often come back, because a tear in the meniscus will allow further penetration of the synovial fluid into the cyst. The management of a meniscal cyst usually involves an MRI scan of the knee to determine the presence of a meniscal tear and the location of the cyst. In the presence of a meniscal tear, partial arthroscopic meniscectomy followed by arthroscopic cyst decompression is the treatment of choice. If a tear is not confirmed at the time of arthroscopy open decompression of the cyst, performed through a mini-arthrotomy, combined with “outside-in” meniscal repair is the best treatment option. 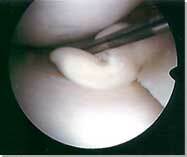 Recurrent meniscal cysts are not uncommon and open cystectomy may be required. In any case, the peripheral meniscal body should be preserved and the meniscus should not be excised under any circumstances. Clinically lateral meniscal cysts are far more common than the medial ones. However, MR imaging reveals a different pattern. A retrospective review of 2572 knee MRI reports, for the presence of meniscal tears and cysts, revealed that meniscal cysts occur almost twice as often in the medial compartment as in the lateral compartment! Medial and lateral tears occur with the same frequency. These findings, when viewed in the context of the historical literature on meniscal cysts, suggest that MR imaging detects a greater number of medial meniscal cysts than physical examination or arthroscopy, and that MR imaging can have an important impact on surgical treatment of patients.